Chanteur Country US né Arrett Marwood Keefer, le 14 Juin 1913. Rusty Keefer a enregistré chez Cowboy et Coral Records. Il a accompagné Bill Haley durant les années 1940 et 50 et est le père des Keefer Sisters. 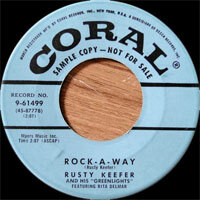 Rusty Keefer est décédé en 1967. 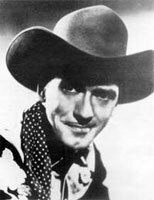 US Country singer born Arrett Marwood Keefer, June 14, 1913. 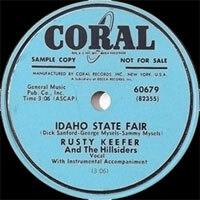 Rusty Keefer recorded at Cowboy and Coral Records. He accompanied Bill Haley during the 1940s and 50s and is the father of Keefer Sisters. Rusty Keefer died in 1967.